Laboratoire National du Sud (LNS) de l’Institut National de Physique Nucléaire (INFN). Catane (Italie). 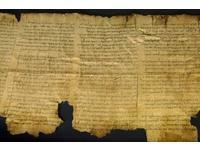 The origin of the Dead Sea Scrolls has been discovered thanks to a particle accelerator. According to the research carried out by the National Laboratories of the South (LNS) of the National Institute for Nuclear Physics (INFN) in Catania, the scrolls that contain the oldest biblical texts in the world (which date back to one to two centuries B.C. to a few decades A.D.) have been made in Qumran, in the same area on the Dead Sea coast where the documents were found half a century ago. The results were presented in the UK, in Surrey, during a conference on particle physics 'Pixe', by research coordinator Giuseppe Pappalardo. The mystery of these very old documents (around 900 in total) was partly resolved by the joint use of a new analysis system called Xpixe, patented by the National Laboratories of the South of INFN, and the particle accelerator of the Laboratories. Seven fragments of about one square centimetre have been analysed in collaboration with researchers of the Institute for Archaeological and Monumental Heritage (IBAM-CNR).